Hey everyone, welcome to day 2 of Blogmas, or as everyone else calls it, the “12 Days of Anime!” This year was pretty BIG for us anime collectors in the states; several titles that had gone unlicensed for the looooongest time were FINALLY license-rescued and saw physical releases this year. Most were given that Blu-ray touch for the first time ever, and some even lucked out by getting an English dub, despite the YEARS of neglect. That’s pretty awesome of them. Particularly, from 2016 September to the earlier parts of 2017, Funimation led the rescue front, releasing long-awaited titles like Haruhi Suzumiya, Code Geass, The Vision of Escaflowne (via Kickstarter), and more. For this post, I’ll be highlighting my favorite titles that I picked up from this year alone. So yeah, these are my top 10 releases from least to most anticipated. Here we go! This film needs no introduction, as it means A LOT to many, many, MANY fans out there. Unfortunately, at the time of writing this, I have not seen Haruhi Suzumiya. BUT, I did manage to snag one of the last copies of the collector’s edition before they went out of stock, as well as a copy of this film when it came out. In other words, I’m saving it for one epic rainy day, but should I had seen it by now, I’m sure it would’ve been close to the top. GOD BLESS FUNI for saving this film and bringing it to Blu-ray with the rest of the franchise! Escaflowne may have been my first Kickstarter I campaign to participate in, but it most certainly won’t be my last. Recorded over with a brand new English dub (I did try out the old one, wasn’t too big a fan), Escaflowne was a blind buy, and I have to say it was a pretty neat show. Surprisingly, I haven’t reviewed it yet, but maybe after I get around to the film I’ll just review the entirety of the franchise. While this limited edition Kickstarter exclusive box is fairly nice looking, it’s nothing compared to the gorgeous hand-drawn art style of the collector’s edition. At least the reverse covers make it look like a complete set. I showed the back side of the box because the front is the same as the little art pamphlet. It’s also cooler. By far the oddest entry on this list that you will read, this film has some very odd history. To be fair, I hadn’t heard of this film before either—it wasn’t until I came across a English trailer on YouTube featuring Erica Lindbeck that I immediately put everything that I was doing now to rush and preorder it on Amazon. There was just an underlying charm or witty humor in its delightful trailer, and Erica’s brief yet strong and somehow resilient portrayal as the lead (presumably the titular Miss Hokusai at the time) was enough to convince me it was worth it. The film ended up being fairly good, nothing like a Ghibli film (though it’s not really fair to compare like that). I think a second rewatch would have allowed me to place it higher up on this list. Ever since I heard that more Code Geass existed—and it served to fill in events that took place during the series—I knew that Akito was a must. And though it doesn’t quite live up to the original’s masterful characterization and story (not even close, but it’s a tough show to beat), I did enjoy this little set of OVAs—the dub was pretty solid too, complete with accents! And ooh look, pretty art cards! Now, y’all already know that I love me some Sailor Moon, especially Crystal for its more accurate take on the manga’s rich story of betrayal and tragedy. Despite what anyone says about the CG animation or the ridiculously long legs, I still love Crystal, almost as much as the original; for me, both are necessary to bring out the depth of Usagi’s tale. That said, Crystal II was definitely a step down from the first. The plot was fine, accomplishing what took R +30 episodes in like 12, but the same main problem prevents Crystal from matching its predecessor—the characterization (particularly of the villains this time around) is incredibly weak. Aside from Usagi, Mamoru, and Chibiusa, there is very little time left for everyone else. I still love this saga, however, and I CANNOT wait to pick up Crystal III! The English dub is excellent for this one, BTW. The holographic finish on these Crystal covers is gorgeous—I only wish there was a consistent theme between all of them. Anyone remember when this film was subtitled “Promise of the Rose” by Dic? Yeah, well I still call it that >.< and I have no regrets. Though a technically A-OK film, much of the nostalgia was lost with the removal of the English insert song “The Power of Love,” which I still jam to daily! The original Japanese song is, to be fair, still kickass. I didn’t get to witness R The Movie on the big screen like everyone else, but now I’ll be able to watch it whenever I like! I think this cover art was exclusively created for Viz’s release, so HUGE props to them on that cause it’s absolutely gorgeous. YASSSS SAILOR MOON S AND THE OUTER SCOUTS!!!! Of all the releases to come before it, this was the one I was most excited for—and boy did it live up to its reputation! You see, as a child, I watched this series on like 4 or 5 VHS tapes. Those tapes chronicled all of the Sailor Moon knowledge that I had, until I picked up Viz’s first release of it and watched the whole thing in sequential order. My childhood self was absolutely SHOOKETH to find out just how dark the real, uncensored story was. I’m still partially in disbelief at S‘s ending. But alas, the show goes on, and I cannot wait for SuperS in the spring! Viz’s other Sailor Moon DVD sets continue to look pretty bland, but at least they look nice together as a set. Does this film even need an introduction? I mean, seriously, it was advertised like hell in 2016, and has been praised ever since. And you know what? It’s deserving of every good thing said about it. Now that I own the Blu-ray myself, I’ll elaborate more on this one in a review and theater experience coming up soon, heh heh heh. But for now, know that this one was a short, painful wait, yet one made all the more worth it because of the immediate NEED to experience it all over again. THE HOLOGRAPHIC FINISH ON THE SLIP COVER IS EVERYTHING. I tweeted my reaction to this surprise and Funimation retweeted it, causing it to blow up to 200 likes in one day. I’m famous now. In terms of looooong-awaited releases, this entry is hard to beat. I’m a huge Steins;Gate boy. In fact, it’s in my top 5 favorite anime of all time. When the film first came out in Japan, of course I -illegally- streamed it somewhere on the internet, and I have no regrets for doing so, as little did I know that it would not see a U.S. release for FOUR YEARS. 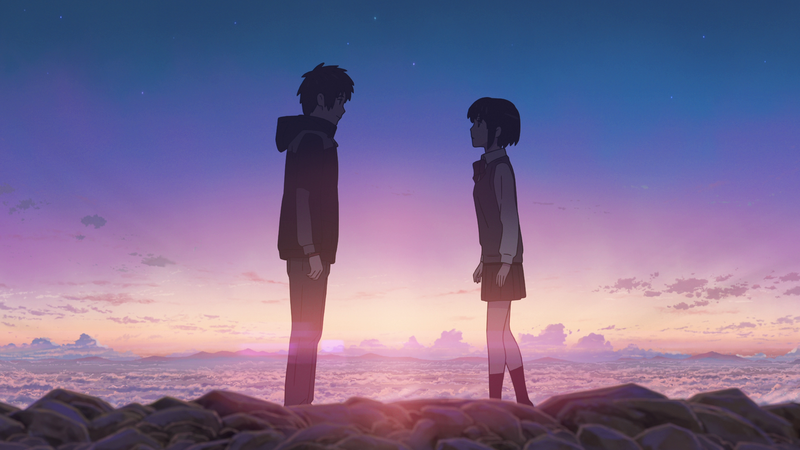 Well, after a little bit of time travelin’ myself, four years are up, and now I can relive—what I like to believe is—one of the most perfect films to follow up an anime series. Long story short, I’m very happy to have this, and to FINALLY listen to J. Michael Tatum, Trina Nishimura, and the rest of the spectacular English dub in all their glory! I’m at a loss for words. The art parallels between this set and the series is just so damn clever. We’re down to the last two—IT WAS SO HARD TO PICK. But of course it made a spot in the top five! 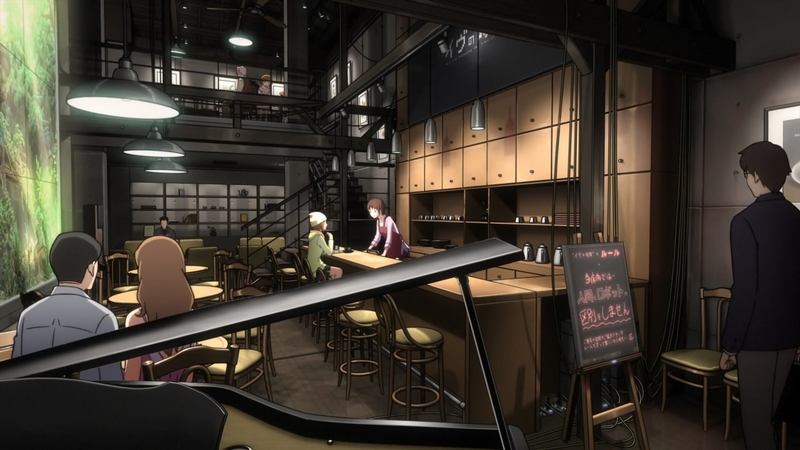 Hyouka‘s lead, Oreki Houtarou, has been the face of this cafe for years now. That said, you can probably expect this to be one of the most celebrated releases for me in recent times. Hyouka was one of those Funimation license rescues that took FIVE years to get here. This is why, upon its announcement, that many thought the show would receive the sad DVD/sub-only treatment. Boy were we surprised. Not only would it get the Blu-ray combo pack special, but IT GOT A FREAKIN’ DUB. To make things even better, THE DUB IS FANTASTIC!!! (Sadly, there was no LTD ED box, but I made my own thanks to Simply Gee’s help, so we’re good I guess.) No words can honestly express my excitement, but there is still one title that deserves the real gold here . . . I watched this show in the spring of 2014. That’s three years ago, but it’s not as long as some fans have been waiting for. Gosick is SIX, almost SEVEN years old. SEVEN, and it had gone unlicensed for all this time. 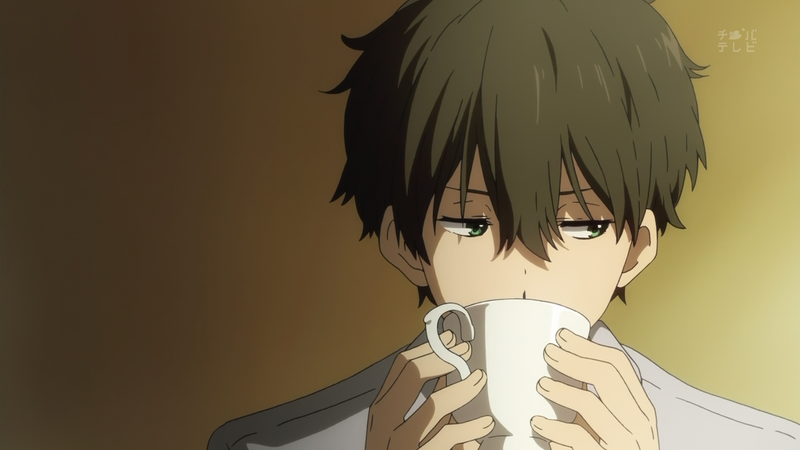 Some of you may argue that Hyouka is far better than Gosick, both as mystery shows and physical releases. And you know what, I kinda agree. But riddle me this: How much do you value the first anime you ever watched? Gosick is not that title, but it was one of the firsts that wowed me as a youngster—everything from the silly, lovable characters, the old-fashioned European atmosphere, and that EPIC ending theme that triumphantly rang at the end of each episode just enthralled me, it really did. So here we are, so many years later, and so many anime have gone by since. On over 20 occasions, I was THIS close to just buying a bootleg of this series (heck, not sure how, but it supposedly even came with a soundtrack!). But I had faith, a near-unwavering faith that one day, however long it would take, someone would save this show. Once it left Crunchyroll a few years back, I had officially lost all ties with it—but I still carried my faith with me. And then Funimation finally lifted my prayers: “GOSICK Blu-ray/DVD English Dub & Sub COMING SOON.” That’s all it took to make this year awesome for me as a collector and a fan. Even though the dub is merely serviceable, I still have the sub; Even though it didn’t come with a fancy box to house the two parts, I made my own; EVEN THOUGH it took SIX YEARS to be rescued, it’s always better late than never. 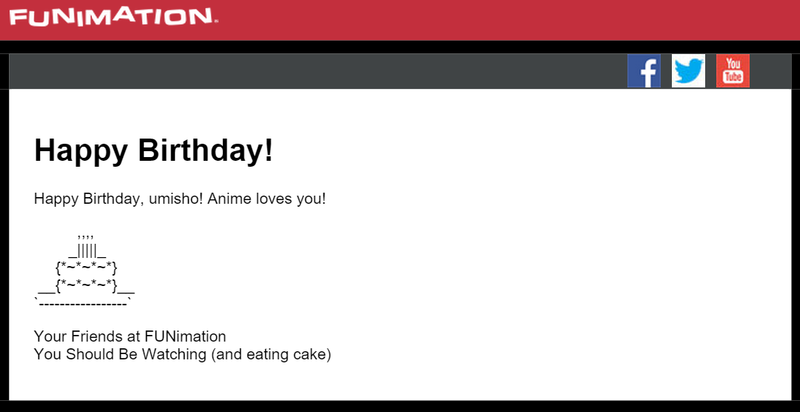 God, I love Funimation. And for all these reasons and more, this why I love the exciting, unpredictable industry that is anime. Let me know if you had any favorite anime releases from this year! Heck, I didn’t even get around to the magic happenin’ at Sentai lately (to be fair, I haven’t picked up their latest LTD EDs yet, though—still lookin’ at you, Haikyuu)! This wraps up Blogmas Day Two of the 12 Days of Anime! Thanks for reading, and I’ll catch you all tomorrow! 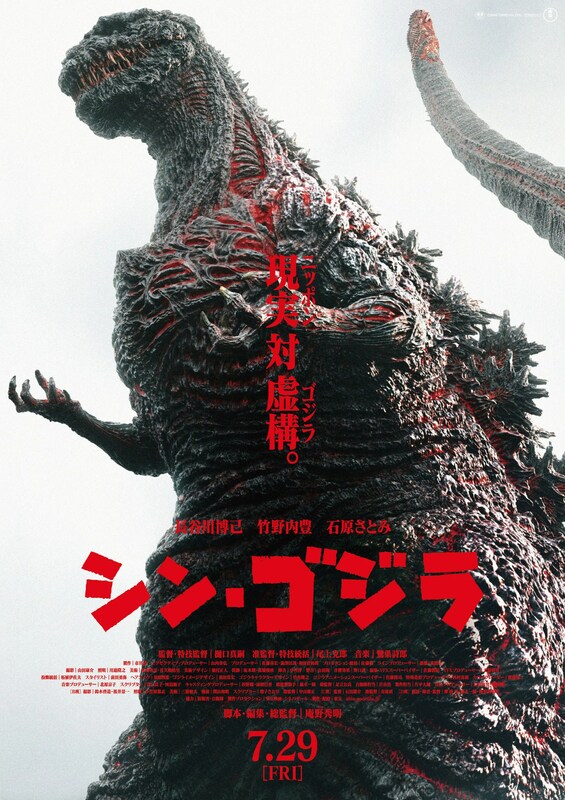 A brief discussion on the summer 2016 Japanese film “Shin Godzilla” (also known as “Godzilla: Resurgence”), produced Toho, co-directed by Hidaeki Anno and Shinji Higuchi, based on the original story by Anno (Evangelion). This is how Funimation captions the deadly film containing the biggest, baddest Godzilla known to mankind, and accurately so. (He’s literally the tallest in the franchise!) But before the King of Monsters surfaced from the deep, it was just another quiet day for Japan. Chaos quickly floods the scene when a giant, strange gilled creature explodes from the ocean’s surface and begins tearing through the city. More Than BOOMS! and BANGS! Despite boasting action (it’s a Godzilla film for crying out loud), there’s a surprising amount of substance, particularly a possible social commentary on the hierarchy of the Japanese government and they way the nation handles foreign affairs during war time. Specifically, we are frequently shown how frustrating and slow policy can be. The film’s first half centralizes on political officials arguing about who should do what, when, and their reactions to the unbelievable events unfolding—most were consumed with disbelief, in fact, except for the young yet forward-thinking Deputy Chief Cabinet Secretary Rando Yaguchi, our basically-main character (and wow, what a title). We join Yaguchi in his frustration against the higher-ups, as well as his struggle to make amends with the innocent lives lost because of the government’s inability to act early on. While those above him in rank merely wish to hold fast to their comfortable, well-paying seats, shrugging off the impending doom that is about to likely kill them all, Yaguchi pulls together every asset that he can to find out what Godzilla is, and solve the mysteries surrounding Goro Maki’s research on the subject. It’s sad to admit how painfully real the execution of this all is. Unlike the other officials who merely bicker about bureaucratic protocol and semantics (and not take things seriously), Yaguchi deals with exactly what’s in front of him. He knows he’s trapped within the system’s web, but he doesn’t fear questioning those above him in order to do his job correctly and honorably. Actor Hiroki Hasegawa conveys the complexity of Yaguchi’s character impressively, balancing fitting facial expressions for each emotional hit: a mix of concern, anger, sadness, and confusion. As I side note, I thoroughly enjoyed the excitement that came with watching Godzilla transform from the weird gilled lizard on all fours to the menacing tower of terror we’ve come to know and love. It was so much fun! One small small complaint that I did have was (and I’m not sure if this actually counts) that I couldn’t really tell if the CG done on Godzilla was “good” or not. Seriously, I couldn’t. Was he creepy lookin’? Sure, but I’m not sure how this makeover compares to previous ones. Also, while his explosive beams later on looked absolutely terrifying, I didn’t like the cheesy sound effects for the explosions—they felt like they were missing a low boom to ’em, or perhaps an epic bass you’d expect from a Hollywood explosion. Most of the film’s complaints are targeted at the lead female, Kayoko Ann Patterson, portrayed by Satomi Ishihara, whose unfortunate script is loaded with English-heavy dialogue. In an interview, she even stated “Sometimes it’s so frustrating, I just want to cry,” and by NO means is any of this her fault—that’s a director issue. Her character is meant to seem very American, and while we definitely get that feeling, I can’t help but think that her normal Japanese speaking would’ve sufficed the whole way through. Anyway, I still love Kayoko to death because of how her character acts as an excellent foil to Yaguchi’s—both see themselves in higher positions, but for now, they work together efficiently with what they’ve got in their own ways. The Engrish problem is solved by switching the language settings to Funimation’s English dub, which is especially wonderful because the subtitles just fly by! Shin Godzilla is a film about talking through the problem, and less about any spectacular human actions. The political nonsense in the first 20 minutes, as well as the ending with solving Maki’s quote (which I’ll get to) are much easier to understand with the dub. If you don’t mind live-action dubs, do give this one a go—it could help immensely with understanding the film’s main messages. More than having knowledge of the franchise, it’s historical context that is needed for full emotional effect here. Japan was rocked not once but twice by an evil that shouldn’t have even been unleashed on the planet: the atomic bomb. History has learned that the destruction that follows an atomic bomb is not cool. It’s not something the U.S. or any country should glorify, and this film makes sure of that. Godzilla was birthed once the long-term effects of radiation poisoning revealed themselves as something just as fearsome and frightful as the bomb itself—gosh, perhaps worse. This brings us back to the film, which could stand an allegory for nuclear war and its long-standing effects, Godzilla itself mirroring the disastrous earthquakes, tsunamis, and radiation that hit the poor nation all at once. Unlike normal action films where you’re just waiting in anticipation for the bad guy to unleash their awesome powers, I was left not cheering, but shaking with fear of the results that, very closely, mimic an atomic bomb. The theme of destruction is a powerful one, a scary one, and that’s how this film shocked the viewers—the moment Godzilla unleashes its wrath is one that can only be witnessed . . . and feared. 1. Sharla (Sharmander on YT)—Being one of my favorite YouTubers, it’s rare to ever hear about her work life as a dialogue coach, and so I was ecstatic once she put out a video saying that she worked with the cast (particularly Yaguchi and Kayoko on those stubborn English lines) and Anno himself. 3. Hidaeki Anno—THIS MAN puts me through so much stress, and yet I can’t ever look away whenever I hear his name involved in a project. He is the reason I jumped into this foreign franchise, after all, so that’s got to mean something, right? He perfectly combs together realism, destruction, and rebirth in such a way that merits a masterpiece with every work. In Shin Godzilla, he took me back to the first time when I saw Evangelion and was impacted in such a way that I’d never be the same without it. I’m glad Anno took the break between 3.0 and the final Rebuild film, because hey, sometimes we have to “Do as we please,” and I respect that. Thank you for giving me my Evangelion fix—it was an incredibly enjoyable experience! These are the few words left by the enigmatic Maki, and yet, they remain the strongest message within the work. It’s something so simple, to do as you want to, though I get the impression that it’s not a common Japanese lesson taught. No, this isn’t a wish or a passing thought, but a statement aimed DIRECTLY at Japan. Towards the end of the film, the Prime Minister must either give consent to or deny the United States’s declaration against Godzilla: “Take care of it now, or we will nuke it.” That’s right, history will repeat itself. Japan would risk losing the pride and dignity it spent so many years recuperating to the humiliation of starting at ground zero once again. With the titular creature MIA towards the end and the U.S.’s threat, it almost begs the question: Are humans deadlier than Godzilla? But oh, “Danger is an opportunity for personal growth,” remarks the U.S. President in the film. Yeah, not for this country. The true climax of the film comes down to a duel between philosophies—to accept help and then rebuild, or own up to the situation. And when Japan finally does decide to take matters into its own hands, fighting the way only they do best by studying their enemy, the scientific team makes work of the King of Monsters in a way that, without spoilers, makes me proud to be human. Using science, mankind’s greatest weapon, the team transforms the impossible into plausible—theory into reality. It’s that moment when you realize you CAN stand for yourself WITHOUT having to kill another being—THAT is the big takeaway. Take pride in the things you can create and accomplish together, NOT destroy. And finally, for ONCE in your overly obedient life, do as YOU please, NOT what the others want. Shin Godzilla is incredibly smart, realistic, meaningful, and genuinely scary at times. Most of all, my god, if this film had come from my country, I’d be overflowing with pride, too. Have I been completely Godzilla-fied? Haha, not quite, but I will definitely be keeping an eye out for future installments, including the wildly anticipated CG Godzilla film directed by Gen Urobuchi, another one of my favorite directors in the industry! Shin Godzilla may not be anime, but I’ll let it slide into the “Caffe Mocha” selection as grade-A movie material for sure, and for everything it stands for. Shout-out to Scott (Mechanical Anime Reviews) for hyping me up about it, and for covering the film way better (and quicker) than I did here. But YESS, at about 1 o’clock or so where I live, I will be donning another year of experience points and growth. We’ve baked cakes and I’ve made frosting, so we’re all set! WOHOO I bought myself a Mami Tomoe Nendoroid and it came in the mail on Tuesday, so a bit early but she’s SO AWESOME XD Cake, Mami, Cake, Bebe. TIRO FINALE!!! Anyway, this is just an update so you know what I’ll be doing today. I plan to have so much fun that I’ll blow up!